“We call on the government to, as a matter of urgency and in the supreme national interest, suspend the Ameri and Karpowership deals and make the details available for broader public scrutiny,” he said. He argued that the renegotiated agreement, as presented by the government, had no legal opinion from the Attorney-General. 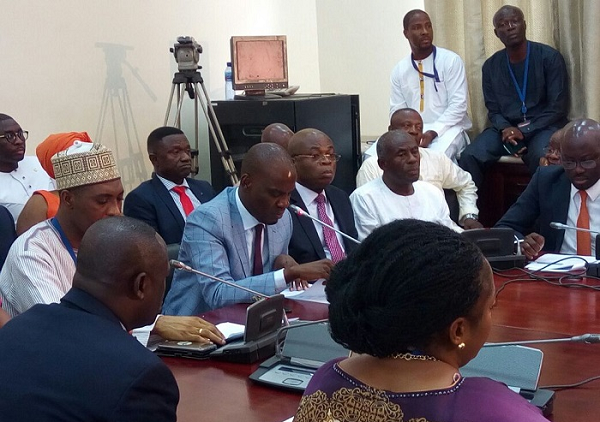 Additionally, he said, officials of the Public Utilities Regulatory Commission (PURC) who appeared before the Mines and Energy Committee of Parliament confirmed that they had not approved the proposed tariff structure and that there was no value for money audit on the agreement. Mr Jinapor said the Minority found as scandalous the attempt by the government to introduce a third party, Mytilineos International Trading Company, to assume ownership of the power plant for an extended 15-year period at a cost of $1.035 billion when it was left with just two and a half years for the government to take complete ownership of the power plant. He said the current agreement had a tenure of five years, with a total payment of $510 million. "It is important to emphasise that the government of Ghana is not required to make upfront payments. At a monthly payment of $8.5 million, the government should be left with an outstanding amount of $255 million spread over the next 30 months, after which the Ameri plant is expected to be handed over to the government of Ghana," he said. According to the Minority, it had taken a critical look at the proposed renegotiated agreement and could confirm that the agreement was nothing but “a complete rip-off and an attempt at rent-seeking by persons in high places”. It posited that it was universally acknowledged that the first and foremost responsibility of any well-meaning government was to ensure that due process was adhered to in presenting agreements before Parliament. “It, therefore, came as a huge shock when the Minister of Energy, Mr Boakye Agyarko, laid before Parliament the new agreement without observing basic principles and protocols,” Mr Jinapor said. A memorandum submitted to Parliament indicated that the new transaction had a waiver of $52.7 million due AMERI Energy that the government would have had to pay. However, Mr Jinapor said: "Even as we discuss this Ameri agreement, we wish to also bring to your attention yet another scandalous and corruption-riddled agreement being renegotiated by this same Energy Ministry under the 450 Karpower agreement." "This renegotiated agreement (Karpower) is even worse than the Ameri renegotiated agreement presented to Parliament by Mr Agyarko. "Indeed the renegotiated Karpower agreement stinks... with big fishes in government superintending the looting of the state under this new deal," he said. He explained that the Minority would soon engage the total Ghanaian public on "this stinking deal and we shall make the details available to you". "To extend the Ameri agreement for 15 more years at this inflated cost when we have about two and half years for the plant to revert to government", he said, was criminal and a "major blow to our nation. Everything that has happened so far to the Ameri transaction shows that the NDC did nothing wrong and rather it is the NPP that has many questions to answer for the way they have handled this matter so far."